great job saving hundreds of children." The Eagle Academy Model is a maximized educational approach to nurture the "whole" child so that each Eagle Academy student is successful in the classroom and in life. 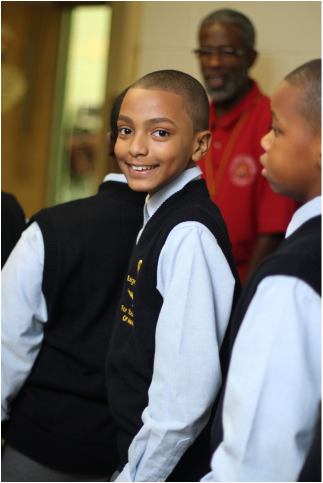 Our goal is to provide the resources so that inner city young men can achieve their promise as students, as family members, and as engaged citizens in their communities. The result is an intimate, specialized public school, with small class size, trained and committed teachers, and a full complement of in-school and out-of-school programs. Eagle Academy students attend school from 8 am to 5 pm. A rigorous college preparatory curriculum begins in 6th grade through graduation and includes Advanced Placement courses. Academic rigor and high expectations flow beyond the traditional school hours to the mandatory extended day and Saturday Institute programs, which include workshops for parents, life-skills training and remedial services for our students. Rituals establish expectations shared by students, teachers, parents, and school administrators and include school uniforms, daily town hall meetings, and athletics. Summer Bridge programs allow incoming new students to gain a foothold in the Eagle Academy model. Mentoring brings exposure to positive professional male role models. To learn more about the Eagle Model from the Founding Principal David C. Banks pre-order your copy of "SOAR" today.